For three years Nadine Kimble has been the receptionist at Fox and Fisher. She’s ready for more—but Lindsay and Nathan keep stalling. Finally she decides that she needs to prove herself by solving a case. One afternoon when she’s alone in the office, Nadine decides that the next client who walks in the door is going to be hers. 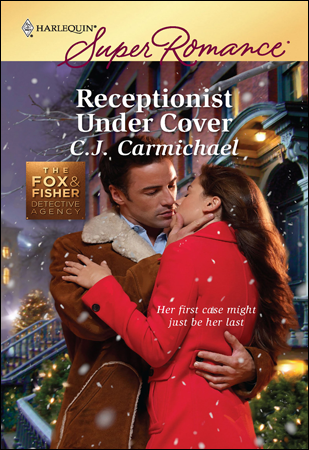 When I started the Fox Detective Agency series, I knew that Nadine Kimble was destined to be more than the receptionist. She knew it, too. But she has waited patiently for the opportunity to advance her career, only to be put off time and again. But will she be up to the job? After all, Nadine is such a softie. Does she really have what it takes to succeed in this business? In this third and last book of the trilogy Nadine finally takes control of her destiny and seeks her heart's desire. What I love most about Nadine is that she turns her back on money and social status in order to follow her dream of becoming a private detective. And she steps well out of her comfort zone to make that dream happen. Speaking of stepping outside of her comfort zone, have I mentioned Patrick O'Neil? He's the kind of rugged hero that you don't want to mess around with. So what's he going to say when he finds out the private investigator he hired to find his son, is really the firm receptionist? This is the second book I've written that has an avalanche scene. The first was, A SISTER WOULD KNOW. It was growing dark and Patrick started using the Subaru's high-beams whenever there was no opposing traffic—which was fairly often. Though the car was warm, Nadine shivered. "It's awfully dark and deserted out here." No sooner had she said that, than she heard the rumble of thunder. "Is that a storm?" The rumble grew louder and puffs of snow came flying at the windshield. Patrick glanced at the rearview mirror, then hit the brakes. The car slowed quickly, as a wall of snow suddenly appeared on the highway, just visible within the range of the halogen high beams. "It's an avalanche," Nadine realized, shock making her brain numb. "That was an avalanche, all right." Patrick jerked the car into reverse and backed up about twenty feet. Snow, as deep as the car, blocked the road in front of them. "We just missed being buried alive," Nadine realized, as the shock started to wear off. "And we're not hanging around to see if there's more coming." Tires squealing, Patrick executed a three-point turn, then started back in the direction they'd just come from. Nadine sat tensely. Though it was quiet now, in her mind she could still hear the ominous rumbling sound, almost like thunder, of the avalanche. Patrick glanced in the rear-view mirror. "I sure hope no one was caught in that. We should report this as soon as possible." Nadine tried her cell phone, but wasn't surprised that the area had no service. "If we'd left the hotel one minute earlier, we would have been—"
"Don't think about it." Patrick reached over and touched her hand. "We're safe. That's all that counts." He was right, but she still couldn't stop shaking. She'd seen signs on the highway that said 'Don't Stop, Avalanche Area.' But she'd figured they were like those warnings to watch out for deer that were never there. "Don't think about what might have happened," Patrick cautioned, again. "That's a game that will paralyze you with fear if you play it too often. What we need is a back-up plan. Do you recall seeing any motels along this road?" "There wasn't much after Field. Wait a minute." There had been something... "I did notice a sign to Emerald Lake Lodge. Let me check the GPS, see if it's working." She held it close to the window and was grateful when it was able to pick up a satellite reading. "Emerald Lake Lodge is twenty minutes away," she said. Patrick wasn't expecting much on this god-forsaken stretch of highway, but Emerald Lake Lodge turned out to be buried treasure. They had to leave the car in a parking lot, then were ferried by a small bus across a tiny bridge to a cluster of buildings including a rustic lodge and about a dozen smaller chalets. The roof lines of the lodge were outlined in sparkling lights and in the air was the welcoming scent of burning hickory. "It appears we've lucked out," Nadine commented. "Treat yourself to dinner in the main dining room and you'll really feel pampered," their driver told them. He stopped by the side of the lodge. "Once you've checked into your rooms, we'll bring up your luggage. It'll probably be waiting by the time you arrive." A warm fire greeted them in the main lobby, along with the aroma of gourmet food from the adjoining dining area. On the other side of the lobby was a casual lounge for drinks or lighter fare. Directly ahead was a curving staircase, leading to unknown areas. One of two young women behind a counter waved at them to step forward. "We need two rooms," Patrick explained. "We were stopped by an avalanche on the highway about twenty minutes west from here." The young woman nodded at her co-worker. "Denise, you'd better call Avalanche Control and report that." Denise nodded, and picked up the phone. "That must have given you a scare." Patrick noticed the name tag discretely pinned to her lapel. "Yes, Andie, it sure did. But fortunately we weren't injured. I hope no one else was either. Traffic was pretty light." "Yes. It's low season, which is lucky for you, as we have several vacancies. You said you wanted two rooms? Would you like them side-by-side?" Patrick glanced at Nadine, who nodded. "That sounds fine." He caught her eye, and she smiled, and suddenly he was wishing they were here under an entirely different scenario. Because the truth was, he didn't want separate rooms, at all. Nadine turned away, suddenly fascinated by a flower arrangement on the counter. But he could see the pink rising on her cheeks. Andie pulled out a map of the property and showed them how to reach their chalet. "You're staying right across from the outdoor hot tub. It's a favorite among our guests. And would you like me to make you a reservation for dinner?" Again Patrick checked with Nadine and when she nodded, he said, "Sure, that would be great." He took the keys and passed one to her. She accepted it, careful not to meet his gaze this time. They went outside, boots crunching on snow, breath forming clouds of crystals that hung in the still air. The chalets were connected by paths wide enough to allow for the passage of the golf-cart sized vehicles that were used by the staff to transport luggage and supplies. "I'm glad they don't allow cars in here," Nadine said. "This place has a lovely, European atmosphere, don't you think? It's like a charming Swiss village." "Have you been to Switzerland?" She'd asked so many questions about his travels that he'd assumed that she hadn't seen much of the world, herself. She seemed to lose her footing, and he took her arm, amazed at how delicate she was, how much he liked holding her. "Sorry," she said. "I slipped on a patch of ice. Oh, look. That must be the hot tub." She pointed to an area to their right. He couldn't see much, other than a large cloud of steam. But he could hear the quiet murmur of conversation, then a woman's laugh. Their chalets were to the left. Patrick waited until Nadine was safely inside her room, before he unlocked his own. The room was decorated in mountain lodge style, with furniture fashioned from logs and two willow chairs nestled in front of a wood-burning fireplace. The furniture looked rustic, but when he tested the bed, it was extremely comfortable, with soft white linens and a feather duvet. He'd sleep well here, tonight. As long as he could forget that tomorrow he might meet his son. As long as he could stop thinking about the woman who would be sleeping next door. Nadine wore her dress to dinner. She covered her bare shoulders with one of the scarves she'd brought with her. It was black with silver and gold threads that caught the light from the candles and made it dance. Patrick had ordered wine. And they'd both decided to try the evening special, which was venison served with a cranberry hazelnut risotto. Nadine smoothed the white linen tablecloth with her hand. "I can't believe a place like this can exist here...in the middle of nowhere." "Apparently the lake is that way," Patrick indicated a direction beyond the lodge. "It's reputed to be one of the most beautiful lakes in the world." "Maybe you'll have to write about this place in one of your travel books." He nodded. "Between heli-skiing, white-water rafting, and mountain climbing, I think I'm going to find enough to interest my usual audience." She leaned closer to him. "Do you try all the activities you write about in your books?" "Yes. All of them." His gaze seemed to dip a little. From her face, to the low neckline of her dress. 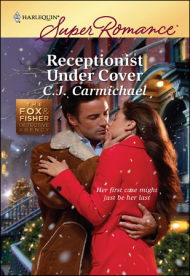 Instinctively she pulled her scarf tight to her body, even as an unaccustomed heat washed over her. There'd been men in her past. Lots of duty dates arranged by her parents and a few romantic relationships with boys from school and university. But there was no one from her past who could compare to Patrick O'Neil. At some point in this trip...she couldn't quite pinpoint the exact moment... she had started developing an attraction to this man. More than attraction, actually, because she'd felt that from their first meeting. No, this was more like a magnetic pull. And she was almost positive the feeling was reciprocal. She wasn't too sure what a worldly, action-oriented guy like Patrick would see in a city girl like her, but she found him absolutely fascinating. She loved the fact that nothing—absolutely nothing—seemed to faze him. He didn't seem to know the meaning of the word fear. Not that she would want to try half the things he had tried—definitely not hang-gliding or parachuting from a plane—but she was terribly impressed that he had. He was still looking at her, she noticed. In fact, he'd hardly taken his eyes off her all night. She felt that wash of heat, again, and found herself thinking about how deliciously quiet and private their rooms were, tucked away from the lodge, next to the lake. He reached for one of her hands. "I hope I'm not out of line in asking this, but...do you ever date your clients?" She felt a rush of pleasure. An instinctive urge to say yes. Then good sense kicked in. "No, I don't. At least—I never have." Oh lord. What sort of answer was that? She'd never dated a client, because until now, she'd never had one. Suddenly she felt as if she was choking on all the lies she'd told in the last few days. What would Patrick say if she told him the truth now? He would understand... wouldn't he? Was she crazy? Of course, he wouldn't. His stakes in this case couldn't be higher. He was searching for his son. He'd be angry and upset... and probably he would insist they head back to New York immediately. And wouldn't that be a shame? They were so close to Stephen, she could just sense it. Later, she would tell him everything. "Not getting involved with clients sounds like a smart rule." Patrick caressed her fingers as he slowly let her hand slip away from his. "But, I've always been a fan of breaking rules."